While I'm recovering from a serious case of "blogging malaise," please enjoy some great news and links from the kidlitosphere. First off, the February Carnival of Children's Literature is up at the Imaginary Blog. The theme is "We Love Kid-Lit!," and Lynn Hazen has rounded up some fantastic posts you don't want to miss. "Share a Story - Shape a Future," a blog tour for literacy is kicking off at Scrub-a-Dub Tub, The Reading Tub blog on March 9th. Taken directly from the tour's website, "This is an ensemble effort not only to celebrate reading among those of us who already love books, but to encourage each other to reach beyond ourselves and do it in a way that we are neither judging nor instructing others. This is a venue for communicating practical, useable, everyday ideas." This is going to be amazing, so be sure to put it on your calendar. "I speak to you not just as a president, but as a father when I say that responsibility for our children’s education must begin at home. That is not a Democratic issue or a Republican issue. That’s an American issue." This really struck a chord with me. While I have strong personal political convictions, I make a concerted effort to keep it away from this blog because instilling the joy of reading in children is the responsibility of EVERY parent, regardless of their faith, politics, beliefs, etc., and my ultimate wish for this blog is to inspire parents (grandparents, aunts, uncles, etc.) establish a routine where they're consistently reading with the children in their lives. It's so important, ya'll! Finally, MotherReader has just announced the date for this year's Kidlitosphere Conference. It will be from October 16-18 in Washington, DC! I'm so super excited because I can finally make it this year! I can't wait and hope all of you other kidlit bloggers out there can make it, too. It seems everyone in this family has something from the grays and indigo blues to the pinks and the reds. Watch out for the pinks they come with shiny tights and a butterfly hair clip. This poetry about a family and feelings hits the mark. The verse sings and the bold illustrations emphasize the emotions through color and facial expressions. Even my 2 1/2 year old understands the reds mean mad in this story. And who has the reds? The mama who doesn't approve of jumping on the bed. Add this book to your library. This is a great way to get young children to identify emotions that are hard to talk about. Have fun thinking of things that make you feel yellow or silver or even purple. Do you have a favorite color? Does it remind you of anything special? If a birthday party had a color what would it be? These are all questions to get the imagination working. This is a very fun read aloud. First published in 2003, it won many awards including the Ezra Jack Keats Award and was featured in PBS's Between the Lions. The paperback edition was published in 2008. Wintergirls is not an easy read, but it's one that I think every girl, teacher, and parent SHOULD read. The book is emotionally difficult because it gives the reader a rare look into the mind of an anorexic girl, Lia. The story begins as Lia finds out that Cassie, her former best friend was found dead inside a motel room. Cassie had been bulimic for many years, and Lia herself has been hospitalized for her own eating disorder twice. Lia seems to be sort of doing okay, but the news of Cassie's death and the fact that Cassie called Lia 33 times on the night of her death sends Lia on a downward spiral. Lia uses every trick in the book to make her parents believe she is eating and maintaining her weight, but it's not until it's almost too late that her relapse is discovered. The book is haunting because it doesn't matter how skinny she gets, she always wants to lose more weight. There were times when I wanted to jump into the book and shake some sense into her and her father who seems to deal with conflict by ignoring what's going on. Even her own mother who is a cardiologist cannot seem to help her daughter recover. Laurie Halse Anderson's writing is intense, beautiful, and chilling all at the same time. It's evident that she thoroughly researched the subject matter and has successfully channeled the mind of a teen suffering from anorexia. I also think it's the type of book that could potentially save lives. I'm sure individuals with eating disorders will be able to relate to Lia's thoughts and feelings, and it may encourage them to seek help. Parents, teachers, and others who read the book may be able to spot the warning signs that someone they know is in danger. The book will be available on March 19th. All I have to say is, "Thank you, Cybils Awards!" If it wouldn't have been shortlisted and then won in the Fiction Picture Book category, I probably would have missed this beautiful gem of a book. The premise is simple. A young boy, Will, finds an injured bird unnoticed by everyone else in the big city. He and his mother take it home to nurse it back to health, and with a lot of love, care, and hope, the bird flies again. The text is sparse, yet powerful, and the soft and richly detailed illustrations of Will caring for the bird add an inspirational and heartwarming tone. But what is best about this book is that it's about much more than a boy caring for an injured bird. It's about hope, dedication, healing, recovery, and beating the odds. But don't worry...the beauty of the book is that it does not contain "in-your-face" messaging. It's subtle yet powerful for those who may be seeking a little comfort. I shed a tear or two reading the book and would recommend giving it to anyone who has had or is going through a rough patch in their lives. This is one of the books that I think should be in everyone's library, not just a child's library. I highly highly recommend it! Last year Karen Katz introduced us to the sassy, sparkly-shoe and crown-wearing Princess Baby who hated being called any other name than her real name. No "cupcake" or "little lamb" for her. You can find my review of that book here. Well, now Princess Baby is back. It's bedtime, but she's not quite ready for bed. All of her stuffed animals must but on their pajamas, brush their teeth, and read a book (or two, or three). 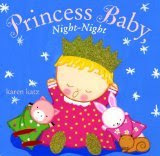 Parents of young children will find the scenario familiar as Princess Baby does everything she can think of to stall bedtime, and little children will definitely get a laugh out of her antics. The satisfying ending may even entice your little ones to go to sleep. I can tell you first hand that my daughter, who is almost two, has loved Princess Baby since the day the first book arrived, and she was super excited to see the newest one. With the new book, the colorful illustrations and the familiar situations in her own bedtime routine. Both of the Princess Baby books have been read multiple times in our house, and I hope to see more in the future. I think they'd make the perfect baby shower gift or birthday gift for a young little girl. Check out other Kids' Picks at Five Minutes for Books. In this entertaining retelling of "The Gingerbread Boy," an old Cajun woman uses her grand-mère's old iron skillet to make magic cornbread. Hoping for the child she never had, she adds a big dash of cayenne to her recipe, and gives the cornbread two chilies for eyes, a peppercorn nose, and a boudin mouth. "Run, chère, run, as fast as you can! You can't catch me - I'm full of cayenne." As he runs through the bayou, he outruns animals who want to have him for lunch, until he meets an artful alligator who MAY prove to be trickier than the boy. 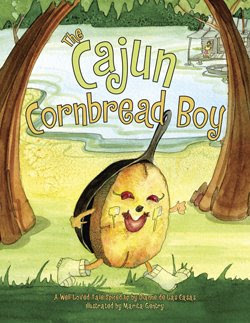 Marita Gentry's illustrations rendered in the colors of the bayou give the story a classic charm, making it a fun read aloud many kids will enjoy. With the help of an adult, kids can even make their own batch of southern cornbread, using the recipe that's included in the back. In an attempt to spend less time on the computer and more time with my family on the weekends, I failed to post that the winners of the Cybils awards were announced on Valentine's Day. "This gripping page turner quickly stood out as the favorite of the judging panel. In alternating chapters, Cylin Busby and her father John tell the story of what happened when someone tried to kill John and how it affected their family. Some readers will identify with Cylin's pain and confusion, some will enjoy John's discussion of life as a policeman, and the drama of the man suspected of the attempted murder, as well as his motives for trying to kill John Busby. Many teens will enjoy this joint memoir that gives readers multiple sides of the same story." Congratulations to all of the winners, and a huge thank you to all of the panelists, judges, and organizers for a fantastic competition! Can't wait until next year! Setting: Part of the USA has been taken over by ultra conservatives and transformed into a fascist state. The Boston area has been destroyed with atomic bombs, and everything north of that is considered a wild and dangerous area, where crazies live and radioactivity affects plant life. Main Characters: Adrian Havoc (16) and his little sister Shriek. Lenora, a girl who works at the zoo. Plot: Adrian, Shriek and Lenore become part of a resistance plot to destroy Homestate's deathgrip on a population that continues to be traumatized by the bombing of Boston. *However, if you're an adult encouraging teen reading, you should be aware that certain frowned-upon four-letter words are a prominent feature of Adrian's dialogue, just in case that's a sticking point. One Beetle Too Many: The Extraordinary Adventures of Charles Darwin takes the reader along on Darwin's journey. The book begins in his youth, and as the text details his academic struggles in childhood and his contentious relationship with his father, children can see the young Darwin's curiosity and love of nature shining through on every page. Darwin's future as a naturalist is visible from the first illustration, where a young Charles trips across a room kicking up dirt and plants and drawings of beetles, surrounded by specimens and snails whose alien-like eyes peek out at him. And when kids read the accompanying text and learn the reason that his cheek is so bulged out - he's got a beetle inside his mouth for safekeeping - curious kids will be hooked. The bulk of the book takes place during Darwin's voyage on the Beagle and his travels in South America. The narrative voice of the story lets young readers make discoveries and ask questions along with Darwin, with an explanation of each separate step that eventually leads to his theory of evolution. This technique keeps a tough concept clear and engaging for young audiences. The tension between Darwin's new theory and the established creationist theory is also cleverly framed to make it accessible for children. Lasky uses Fitzroy, the Captain of the Beagle, as a foil for Darwin. Their arguments serve both to move Darwin's discoveries forward, and also to give a concrete example of how his work would be received by the general population. The text is full of small details that will grab the attention of young readers. In my personal favorite episode, Darwin discovers that the delicious meal he has been eating is in fact a rare example of a nearly extinct ostrich. He runs back to the kitchen to save the bones from the cook, and is able to put together a specimen that is instrumental to his work. And this is not the last time that Darwin accidentally eats an important specimen! While Lasky's text is excellent, it is Matthew Trueman's art that makes this book a standout. The illustrations are densely layered and full of texture, with a level of detail that is extraordinary. The textures and layers use a large number of mediums, and as a read, I found myself wondering how exactly he had created his complicated scenes. In case anyone else is curious about the process, according to the artist, "the illustrations in this book started out as drawings created with acrylic inks, watercolor, and graphite pencil. I moved up the food chain to add gouache and colored pencil. After sealing the pictures with acrylic medium, I did my thicker acrylic painting, then fooled around a little more with graphite and colored pencil. Finally, I added the collage elements, including paper, string, and weeds and wildflowers from my yard and nearby ditches and fields." Trueman uses his mixed mediums to great effect, and the addition of pressed flowers and plants to his already delightful paintings is especially effective. The very real leaves and branches draw attention to the world of nature that was a focus of Darwin's work, especially in scenes that show his notebooks and workspaces. They also serve to make the cartoonish people and animals pop off the page. Trueman's people are constantly in motion, especially Darwin himself, and their action draws the eye immediately. Darwin ages over the course of the book, and I was delighted by the changes to his hair on almost every page. This book is a treat for curious young scientists, or for anyone who wonders about the world around them. Renata Liwska's Little Panda is the sort of book you should buy for your friend who has just had a baby. It's beautiful, it's charmingly illustrated, it involves a lovingly tender parent/child relationship, and it's the sort of book a besotted new parent will love to read over and over again to their little one. When my children were small I always looked for stories like these, illustrated with sparse pencil lines and muted colours, that convey a lot without being too busy or too dramatic. The author has also illustrated the story, and it is perhaps these illustrations that I liked best, because the story itself, while very sweet, is also very short. But the illustrations are wonderful: Pandas playing; Pandas stripping bamboo leaves; Pandas climbing; Pandas sleeping; Pandas sitting in boats, even. These pandas aren't particularly realistic, but that is perhaps where most of their charm lies: they have elongated necks and backs, they sit up in boats, they wear little Chinese hats, they lean on their elbows, watching, and they smile at each other. "How do you know if you haven't heard the story yet?" In what I thought was a clever twist, the book starts off in one type, the plain and very modern Avenir, as we are introduced to Grandfather and Grandson, but when Grandfather's story takes over, the type changes to Humanist, with all those calligraphy-like serifs that make it look like an old Chinese story. For the story IS an old one: How Little Panda learns to cope on his own (inadvertently), while Mother Panda is away foraging. Little Panda confronts danger, but emerges victorious, all by himself. I won't give away the ending, except to say that it resonates in Grandson's present-day world in a way that will make you smile. Oh, and check out the author's website and blog if you'd like to see more of her artwork. It's fabulous. Who's getting a Kindle 2? I don't own a Kindle, but one of my friends has one, and it's super cool. Amazon announced that they're accepting pre-orders for the Kindle 2 starting today, and I want one in the worst way. Do any of you have a Kindle or planning to get the Kindle 2? Reviewed by Callista at SMS Book Reviews. This is a picture book for ages 3 and up that is designed to teach your child some "fun and easy eco-tips." "I use... both sides of the paper. If everybody did this, it would greatly reduce the number of trees we use to make paper." The book is really neat and has great ideas. I'm only not sure about one of them. It says to remind your parents to unplug the tv when we are not watching it. First of all if the child decides to unplug it themselves they could hurt themselves. Second of all, who really does that?? I don't know about you but I'd waste more personal energy pulling the entertainment stand out each time to plug and unplug the tv than I would electical energy by leaving it plugged in. To top it all off, the book is made from 100% recycled material. I plan to use this book to help teach my children about helping the environment and recommend that you do too. Visit Charlotte's Library for more Nonfiction Monday selections. Ever since Janie was a young girl, she has involuntarily been drawn into the dreams of those sleeping around her and has witnessed their thoughts, fears, fantasies, and nightmares. This is completely out of her control and is getting more and more difficult to hide. When it happens, she goes into a seizure-like state, and the scarier the dream is, the worse the reaction. She needs to learn how to control her reactions, but can she actually control what happens in the dreams themselves? In fact, can she actually HELP people or even help solve crimes using her unique talent? First off, this book was captivating. I read it from cover-to-cover in one sitting and absolutely loved the unique and intriguing premise. Janie is a likable character, a strong teen who has had to fend for herself for most of her life because her mother is an alcoholic. The plot is fast-paced and divided into short segments labeled with the date and time. Even though it's told in person, you only see inside Janie's mind, her dreams, what she's feeling and thinking. My ONLY criticism of the book is that in some places, in some sections, the chemistry and emotion between Cable and Janie was a little off, and McMann does more telling than showing. There was one point near the end where they were arguing, and Janie mentions that Cable was "bawling." For me, during extremely emotional parts in book, I'd like more sensory details, and I'd like to be able to feel the emotion. I just didn't experience that in this part, which was probably supposed to be the most emotional part of the book. When I think of writers who have given me that experience and were dead on with chemistry, Maggie Stiefvater and Sara Zarr are at the top of my list. Read Maggie's Lament: The Faiere Queen's Deception, and Sara's Sweethearts, to see what I'm talking about. Speaking of Maggie Stiefvater and chemistry, you totally have to check out the post on her blog, "Thoughts on Nookie and People Completing Other People," where she talks about how she creates romantic chemistry in her writing. Not only is she hilarious, but she offers some great writing tips. That aside, I really did love Wake and think a lot of teens will love it, too. I would really only recommend it to older teens because of its strong language in some parts. Fade, the second book is available on Amazon now even though the official publication date isn't until 2/10. A brown pelican is 11 weeks old and has just learned to fly. Now she must learn to fish and feed herself. She joins a flock of pelicans flying out to sea to fish. This title is a nice introduction to science books for younger children. The pelican is not given a name or internal dialogue as if it were talking to itself. This helps to set the book apart from children's fiction which often uses animals for main characters who act and think like people. 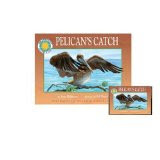 Brown Pelican's behaviors are described in a story format which is approachable and interesting to read. It takes many tries for the pelican to catch a fish and keep it from hungry gulls, who like to steal the catch by standing on a pelican's head when it comes up for air. (Seagulls are so bad). The illustrations are beautiful and clear. The pelican is prominently featured in the pages as she goes about learning to fish. She is also quite large on the page which speaks to the actual large size of the bird. There is a lot of movement as you travel with the flock of pelicans through the sky and into the waves and sea. The text and illustrations reflect each other very well which is key in nonfiction for young children, meaning the text matches the action in the illustrations. I liked this book a lot, and there is more information in a note at the end for parents, caregivers and teachers about brown pelicans. I learned a little about brown pelicans, and I also cared about what happened to the pelican in the story which makes for a good book. This title is timely, too as California is seeing adult pelicans dying and dead on its coastlines this new year. Fourteen-year old Ronnie Page was content with her life at Raven's, a remote mountain lodge in Western Canada that had been owned and operated by her family for generations. When she wasn't bent over a book, Ronnie spent her time exploring the landscape or hanging out with lodge's young guests. But when her father dies suddenly, everything she has come to know and love is stripped away. Ronnie's mother is forced to sell Raven's to Louis Moss, a family friend, and move Ronnie and her sister to nearby Shelter Bay, setting in motion events leading to Ronnie's ultimate arrest. The charge: murder. Tin Angel is exceptionally well written. Cowan's ability to evoke a sense of place and time (1969) is extraordinary. The story itself, however, is slow paced which may limit its general appeal. The language is also quite sophisticated for a 19-year-old narrator which frequently challenged my suspension of disbelief. Regardless, Tin Angel is a well crafted tale with lots of twists and points of discussion. Innocent or guilty— you decide. This book would make a good read aloud, although with text snaking around the page and even appearing upside down at some points, you would want to make sure you are familiar with the text before attempting it. It would also make a good “Reader’s Theatre” piece without too much rejigging. I like this picture book. The text and illustrations fit snugly together, the colours used are deep and inviting, and the character of Wolf is virtuous while still being believable. His interactions with other animals in his imaginary world add humour and personality to the book. The animals question his motives, the squirrel and rabbit call him a liar and the frog is downright rude, but by the end of the book we know how Wolf really views his small animal ‘friends’ and can decide if their initial reactions were correct. I would recommend this book to teachers, librarians and pre-schoolers, while the metafiction element would make it useful to use in a younger classroom where story writing or narrative were being discussed. While all of you football fans were watching the Super Bowl, I was finishing Suzanne Collins's The Hunger Games. If you haven't read it yet, let me give you a short synopsis. What was once North America is now called Panem. The Capitol, a violent dictatorship, strictly controls Panems's 12 districts. Each year, the Capitol holds the violent televised Hunger Games, where two teenagers, a boy and a girl, from each district are randomly chosen to fight to the death. The sole victor becomes a hero, and his/her district is showered with rewards. Sixteen-year-old Katniss Everdeen lives in District 12, in the area of the United States that used to be called the Appalachians. Since her father died in a land-mine explosion years before, she's provided her mother and sister with food by hunting in the nearby forbidden forest. When her sister's name is called in the lottery, Katniss volunteers to take her place. The baker's son, Peeta is the District 12 boy whose name is chosen. What follows is a violent battle among the participants, Katniss's struggle for survival, and an interesting love triangle between Katniss, Peeta, and Gale, Katniss's hunky hunting partner back home. First let me tell you that I've read so many glowing reviews of the book, but the premise threw me off a bit. Teenagers killing teenagers? Really? Not being into gore and violence, I wasn't sure what to think, but as soon as I started reading I was drawn into Katniss's story. Don't get me wrong, there is death and violence in this book, but Suzanne Collins's writing and storytelling were absolutely brilliant. Her sensory details, suspenseful writing, and grasp of Katniss's character made me feel as if I was right in the middle of the Hunger Games. I could visualize everything Katniss saw, felt my heart start racing when she was in danger, and found myself cheering for her and Peeta during the final gruesome battle of the book. Exceptional writing, an interesting premise, and gripping storytelling make this a book you don't want to miss. I can't believe I have to wait until September to read the sequel, Catching Fire.